I visited London in February and we made a stop at Camden Market. That’s where I discovered Halloumi Fries. 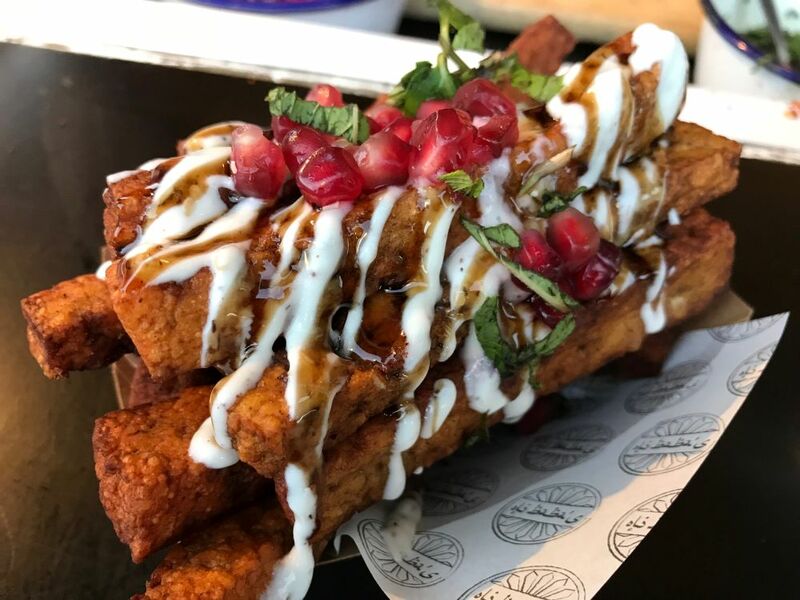 They topped the fried sticks of Halloumi cheese with sumac, zaatar yogurt, mint and pomegranate molasses. These were a real treat but very rich and they definitely needed to be shared. 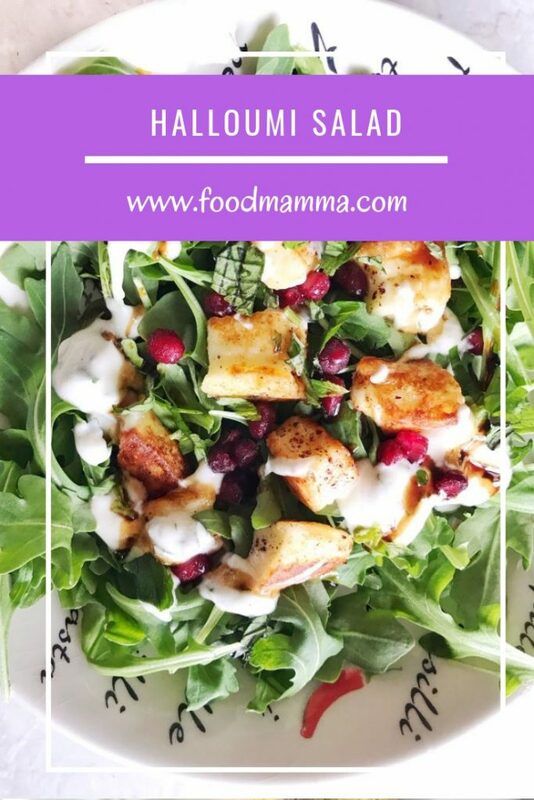 I loved the flavours and thought they would work really well with a salad. Needless to say, when I came back, I went to work on it. Halloumi is a firm cheese that has a high melting point so it’s perfect to fry or grill because it doesn’t melt. I used arugula for the leaves because I love that spicy crunch. I topped it with some pan fried halloumi that I seasoned with sumac. Yogurt flavoured with mint and cumin makes the perfect drizzle on top with some pomegranate molasses. 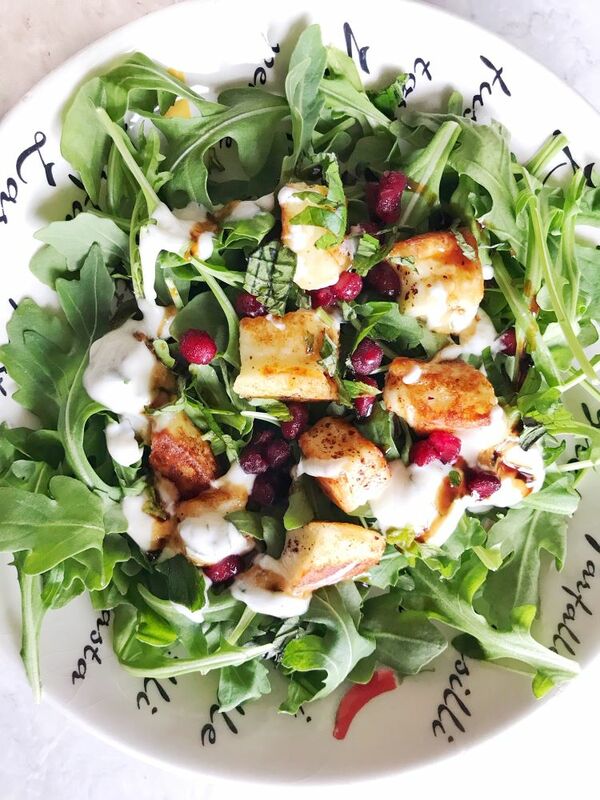 Garnished with pomegranate arils and some mint, this salad is far from boring. For the halloumi, cut them into little squares and lightly toss in flour. Pan fry in just a touch of oil until the cheese is golden brown on all sides. Sprinkle the cooked cheese with some sumac. In 1 cup of yogurt, add in 2 TB of chopped mint, 1/4 tsp of cumin and season with lemon juice and salt. To assemble the salad, add the arugula into a bowl. Add the halloumi and then drizzle the yogurt and pomegranate molasses. Garnish with mint leaves and pomegranate. Looking for the halloumi fries we tried in London. You can find them at Oli Baba’s in Camden Market. Click here for more info.